Ready to build your dream home? This property is the perfect location for building a jewel of a home and having privacy galore. 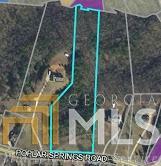 5 plus acres rounds out this listing and offers, privacy, streams, timber, and a prime location. Close to shopping, dining, and I985 access. Priced just right, this property will go fast, so don't hesitate, make an offer today!